We’ve been testing a Griffin SmartDeck recently, looking for a more convenient way to listen to podcasts and other digital audio in the car. We’ve tried FM tuners and always found them lacking in sound quality and power. While regular cassette adapters do a decent job at piping the audio output of iPods to car stereos, their lack of controls mean you have to divert your attention to your iPod, which can be dangerous while driving. The SmartDeck Intelligent Cassette Adapter with Dock Connector for iPod looks like other cassette adapters – a cassette with a long cable hanging off the back. What makes it different from typical adapters is that it connects to your ipod via the dock connector, instead of the audio jack. By doing this, Griffin is able to allow limited two-way communication between the adapter and an iPod. The SmartDeck has internal sensors that sense when you use the forward and rewind buttons on your car stereo, and translate these actions into signals to jump to the next or previous track. Pause and stop buttons pause and stop your iPod, and pressing the eject button automatically pauses the iPod. According to Griffin, the SmartDeck is compatible with any dockable iPod except the 3rd generation iPod with touch wheel. We tested it with a 5G video iPod and had no problems. The deck has two modes. In standard mode, using the fast forward and rewind buttons on your stereo tells your iPod to skip to the next or previous track. In Scan mode, the fast forward and rewind buttons will fast forward or “rewind” within the current track. Overall, we found the SmartDeck to be a convenient way to use an iPod in a car. 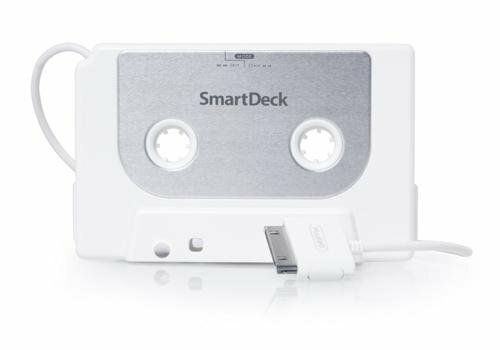 The SmartDeck may be a kludge adapting the world of digital audio to work with older technology, but it’s a kludge that gets the job done.